Dr. Lee has been in veterinary medicine for over 15 years. His journey started in Korea as a young child and attained his Doctorate of Veterinary Medicine from Seoul National University. He transferred to Cornell University and completed his 4th year of Veterinary School working at Cornell University Hospital for Animals. He has worked in several small and large practices, as well as big corporations. He enjoys keeping up with new treatments and diseases by frequently attending continuing education seminars. He is a proud member of the AVMA, SCVMA as well as CVMA. 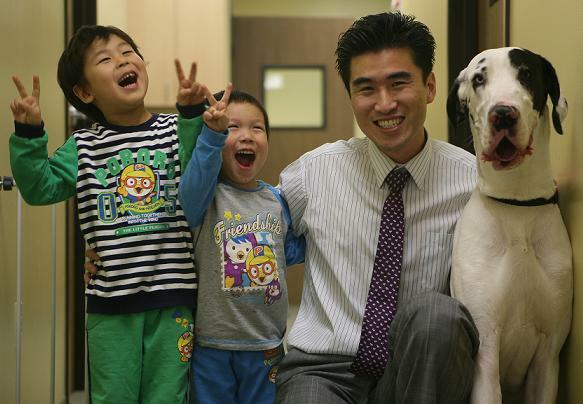 He served as the president of the Korean Veterinary Association of Southern California, and has been a board member of the Korean Veterinary Society of America. His future goals include opening other facilities which would include a multi-veterinarian hospital and a day care facility. When he is not at work, he enjoys spending time with his three young children. They love to do activities together outside.